Samsung's QLED TVs available in two weeks, starting at £2000 | What Hi-Fi? 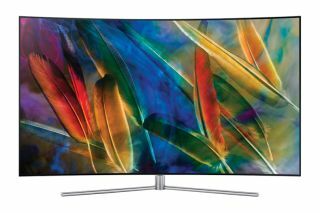 Samsung has announced prices for its range of QLED TVs - it's taking pre-orders now, with delivery expected by the end of the month. Samsung has announced the prices and release dates for its first ever range of QLED TVs. The sets start at £2000 and run all the way to £4900. They're available to pre-order from today, with delivery expected from 29th March. QLED is a new type of TV technology. It promises the inifinite contrast ratio of OLED panels, but with less expensive production processes. It's hoped this could lead companies to pass savings onto consumers, though if these prices are anything to go by it's not happening just yet. Samsung's Q7F costs £2000, while the Q7C will set you back £2200. The Q8C starts at £3000, and the Q9F from £4900. Not cheap, certainly, but are broadly in line with what you'd pay for an OLED set. Sony recently announced the price for its first OLED TV, in the US anyway. Again, it's not cheap, starting at around the £4000 mark. QLED and OLED are still new technologies, which always command a higher price. As production processes improve, components become more widely available and more competition enters the market, prices should come down. The question is, can you wait that long?